This series of volumes represents a comprehensive and integrated treatment of reproduction in vertebrates from fishes of all sorts through mammals. It is designed to provide a readable, coordinated description of reproductive basics in each group of vertebrates as well as an introduction to the latest trends in reproductive research and our understanding of reproductive events. Whereas each chapter and each volume is intended to stand alone as a review of that topic or vertebrate group, respectively, the volumes are prepared so as to provide a thorough topical treatment across the vertebrates. Terminology has been standardized across the volumes to reduce confusion where multiple names exist in the literature, and a comprehensive glossary of these terms and their alternative names is provided. Kristin H. Lopez teaches human reproductive biology through the Department of Integrative Physiology at the University of Colorado-Boulder. 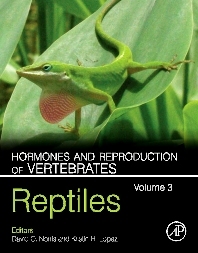 With a background in comparative reproduction and endocrinology, she is an editor of the fi ve-volume work Hormones and Reproduction of Vertebrates (Academic Press, 2011). Her ongoing work with Colorado Diversity Initiative promotes increased access to higher education of underrepresented students in STEM. Integrative Physiology, University of Colorado at Boulder, Colorado, U.S.A.